HDMI yeah I've been down this road a few times now. Came away with results and now Audioquest builds a new cable for me to try and I feel compelled to try it. It has 10% Silver and a 72V Battery so it's essentially a new version of the Vodka-Coffee level cable. I only have one cable so I can't complete the chain from my Oppo 203 to the Sony 5000es receiver to the Sony Z9D TV. If I can get my hands on a 3 or 4m model I can use that to go the the Sony Z9D and I can fully test a complete circuit but for now just from the Oppo to the Sony Receiver will have to do. Boy I hate the idea of any Phantom power around my Denon's HDMI ports. I hear yeah man. But this power only is in the insulation. I understand the technology behind it but I don't think it's something needed. Personally I stopped at the Carbon level cables due to the Battery going on the higher end HDMI cables. I maybe a supporter of Audioquest but I draw the line at the batteries. I had them in my system years ago with a full array of Jaguar analog Interconnects. I sold them off in favor of no batteries. I can't see this case being any different. I always wondered how long the batteries last and cost to replace. I could have a lot of fun with this, but I'd probably get in trouble. If I can get my hands on a 3 or 4m model I can use that to go the the Sony Z9D and I can fully test a complete circuit but for now just from the Oppo to the Sony Receiver will have to do. Remember, your system is only as good as it's weakest link! The DBS system uses 12 volt A23 batteries which cost about $1 a piece. A 72 volt module uses 6 batteries. I have had a pair of speaker cables with the 36 volt modules for about ten years without changing the batteries on them. Probably should change them at some point though. What am I missing? HDMI is digital. Isn't it? Digital has to be done right. But once you achieve that I can't see anything else that can be done to make anything better. BUT I Still take the time to figure out IF my opinion has any value. So I test. I watched Jurassic World Last Night and thought it sounded about as good as good as my system every did. Today after work I decided to Stick a USB loaded with some of my favorite music. I listened to Loreena of Course. Most of you who know me know she is my absolute favorite. I think It's the best it's ever been for sound. I can't confirm that yet as I have not done enough swapping back and forth to listen to full songs and then go back to compare. By the way I'm using the Oppo 203 if you missed that above. So right now as I think about it , has it been to long since I tested DBS? Does that technology separate itself from Non DBS cables? I know when I have my Carbon HDMI cable in I'm in awe in how the Oppo performs. The Mocha didn't make anything worse thats for sure. But now I have to figure out if there is any improvements or am I just getting lost in Loreena as I usually do. I probably shouldn't use her this way as I always fall deep into a calm and state of relaxation even without a glass of Cabernet( Wente is my current passion for Cab's). So I finally finished my evaluation of the Mocha HDMI cable. It absolutely performs as good as maybe slightly better then the Carbon I typically use throughout my system. 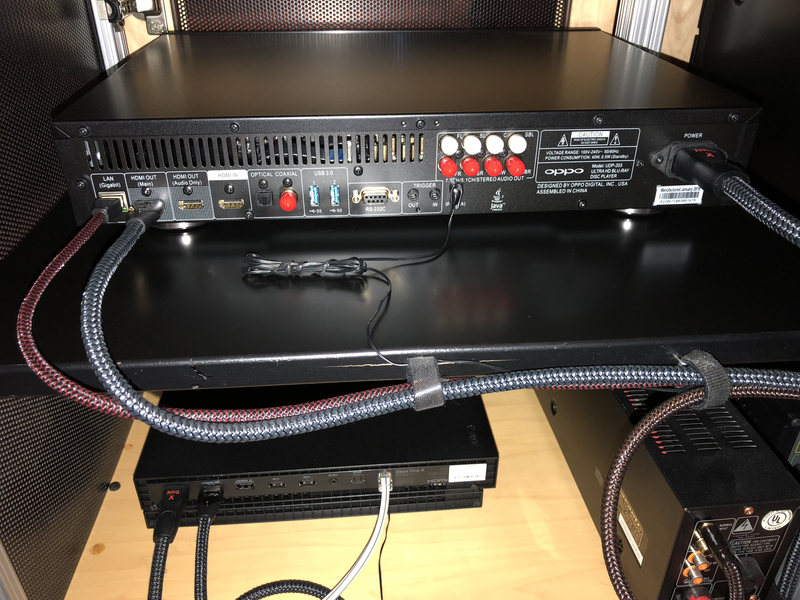 My system is all Carbon HDMI cables from Sources except the Apple TV and Play Station 4 Pro. Those sources have Chocolate HDMI cables which IMO are just about every bit as good as the Carbon's are. To my Sony Z9D TV I have a Cinnamon HDMI cable which IMO is damn near as good as my Carbon HDMI cables. I've been testing and swapping out HDMI cables for years now. I started this adventure with Binary B5 custom HDMI cables as my first introduction into a fully wired HDMI system. Then I swapped out for Audioquest X series A series and then I started with the newer then Pearl, Forest Cinnamon, Chocolate and then finally landing on the Carbon. I never saw a need for the batteries as my system doesn't go months without use. We use the system everyday so I don't think I'm getting any benefits from the battery DBS system. It's designed to keep your cable broken in and charged so no signal is leaked into the dielectric. I had DBS cables years ago and got rid of them. 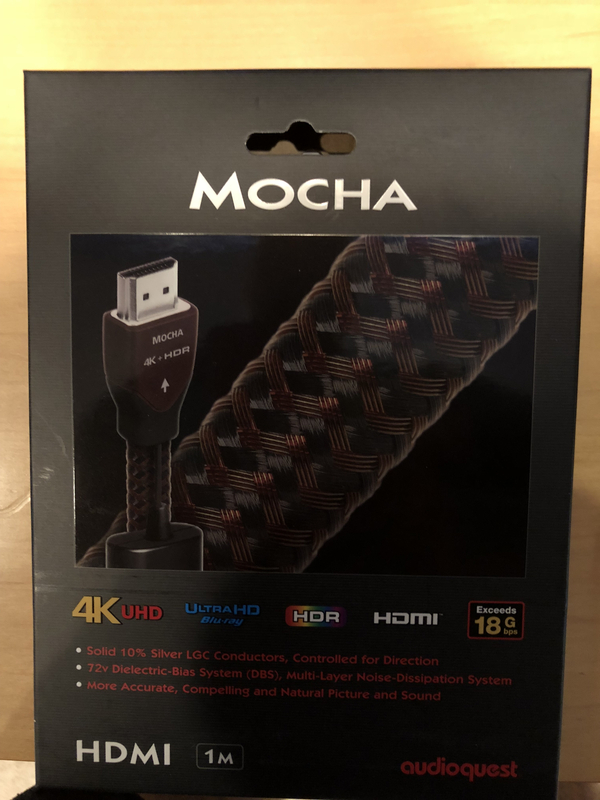 The Mocha is a very good high quality HDMI cable and performance is top notch BUT I don't see any need to keep climbing the digital ladder when there is no real benefits from doing so. I get wrapped up in wire as you get lied to so many times from manufactures trying to sell you better and better cables. I live in this world as I have been in this business for over 20 years and it's also one of my hobbies for just about all my life. 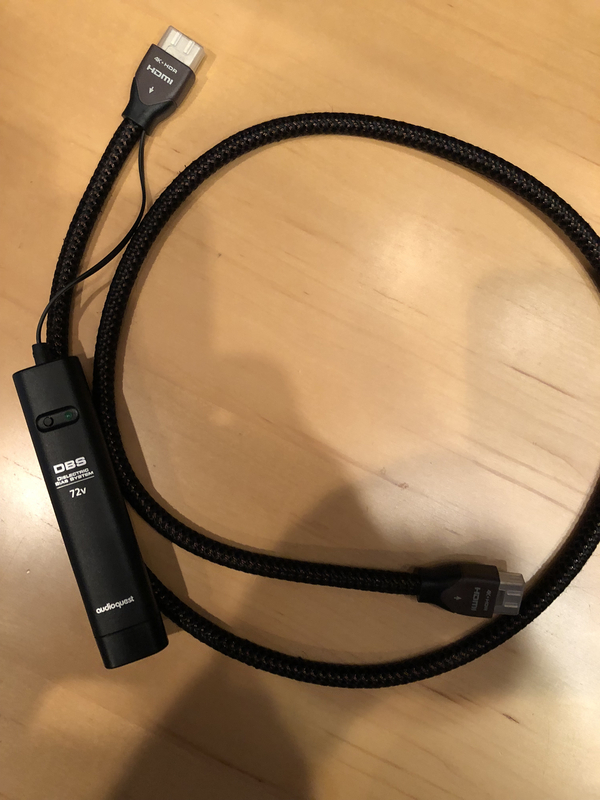 Audioquest HDMI cable ALL meet spec up to 8m and I'll be completely honest there is little to no difference at all when you start climbing up the ladder. You have to struggle to hear or see any differences in performance as the Pearl to the Mocha don't do anything wrong. If I didn't own so many HDMI cables I would go for a full Pearl or Forest full wired system and live with that for a month or 2 to see IF I would miss anything. Then re wire my system as it is now and see if I gain ANYTHING at all. I'm willing to be I wouldn't notice any difference at all. As when I do these HDMI shootouts, it's incredibly hard to even tell them apart. It's not like analog audio at all where the differences between even very good cables are easy to spot. Digital cables when built correctly and pass all spec's can't be improved on in any way. IF the can pass the signal without losing anything or causing any jitter issues or being poorly terminated then your done. No reason to buy the so called better cable unless you like the looks of that cable and or makes you feel better about your system for like lets say matching or colors. YEAH YEAH I'm pretty mental like that I'll buy a step above cable just so it looks nicer sure I'm guilty of that as I enjoy the looks of really nice cables. I feel warm and fuzzy inside and have for decades. But over the years I have learned that you can easily waste your time with cables as IF better performance is your goal and you already have cables that perform top notch then it's probably wiser to look else where like a better amp or source. 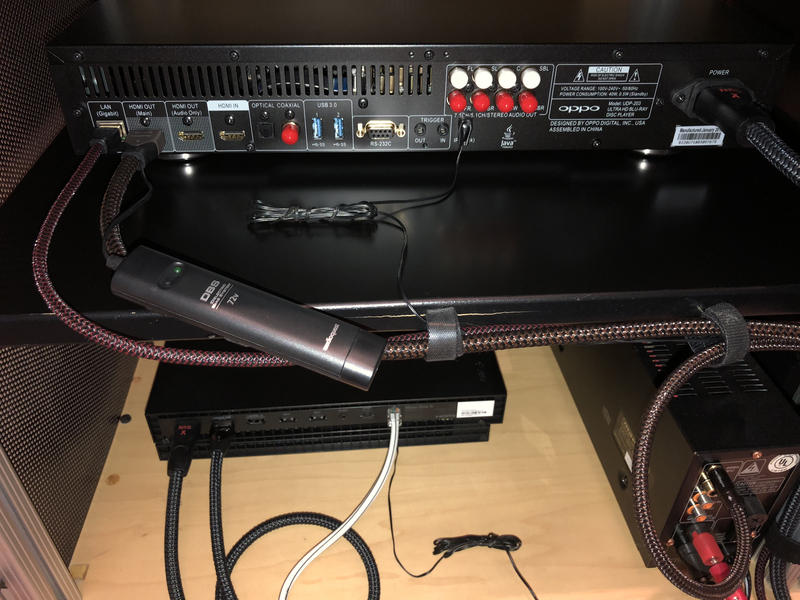 Even room treatments and better speakers will yield much better results in overall performance then keep trying to buy better and better cables. This will be my last Digital cable test as I'm finally done with this chapter in my hobby. I'm completely happy with my cables as they are and I'm NOT re wiring it to all Mocha.